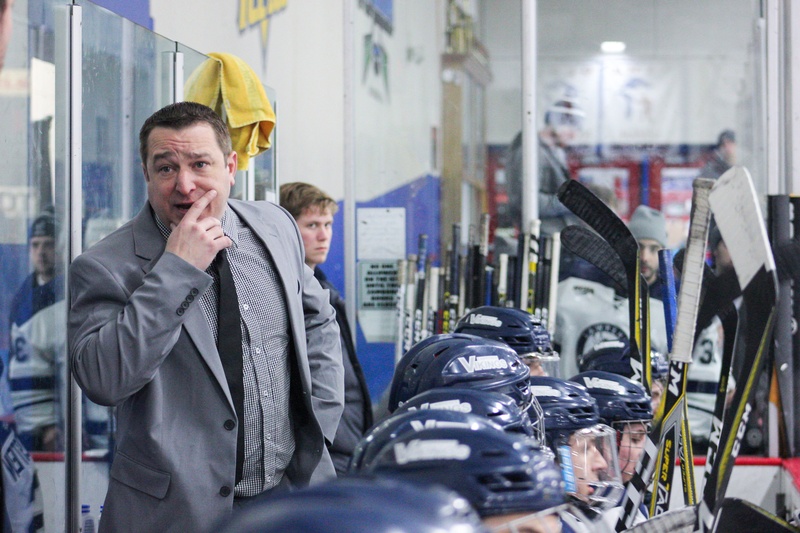 Intense focus is seen on Coach Szkozinski’s face as he makes a plan for what to do with their overtime opportunity. Sophomore forward Danny Toycen out skating his opponent this past weekend. 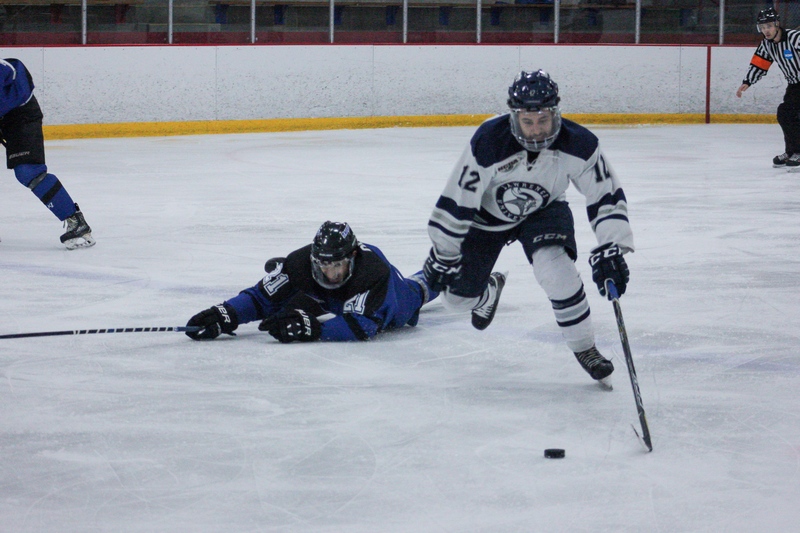 As the weekend passed with Winter Carnival activities, Lawrence University’s men’s hockey team split a set of games between home and away with Marian University in the Battle of Highway 41. This rivalry stems from the distance between the two universities, as they are only 45 minutes away from each other on Highway 41. The Battle of Highway 41 is a two-game series and whoever wins gains ownership of the traveling trophy for the year. Lawrence has not held the trophy since 2017. “We won it in 2017 in front of our home fans and it was an awesome feeling,” senior Josh Koepplinger stated. “There’s nothing better than coming to the rink every day and seeing it in its rightful place.” The team was not able to take home the trophy this year, but the effort that they put into the games this past weekend was strong and resilient. Friday night might have been our grittiest effort all year long,” said Koepplinger. “We continued to battle and stick to our game plan for the whole game.” The Vikings took Marian into overtime and finished the game tied at 3-3. The Vikings started off ahead in the game on a powerplay. Junior Jake Drinkard scored with 4:14 remaining in the first period, but early in the second period Marian tied the game up. Marian scored again with a powerplay in the latter half of second period, carrying their lead into the third period. Early in the third period, first year Vincent Dekumbis was able to score on the powerplay, tying up the game once again. Shortly after that Marian pulled ahead 3-2. With 39 seconds left in the game, the Vikings pulled junior Evan Cline from the goal to give the Vikings a two-player advantage since Marian had taken a penalty. Koepplinger was able to tie up the game again in the last 20 seconds to bring the Vikings into overtime against Marian. Unfortunately, the Vikings faced the same issues that they had in previous games where the puck would not bounce their way, which allowed the game to finish tied at 3-3. The game on Saturday did not reap as much success as Friday’s game. The Vikings were shut out by Marian, 4-0. “We tried to limit their chances offensively on their big ice, and I thought we did that well,” commented Koepplinger. “We couldn’t generate enough quality chances around their net to win and that is why we couldn’t find the scoresheet.” The Vikings had five more shots on goal than the previous night, getting up to 25 shots on goal, but were unable to capitalize on these chances due to the fact that the puck still would not bounce the Vikings’ way. Although this weekend was an opportunity to get a trophy that shows the team’s success and victories, which is important to the team, the points from the games are what the Vikings really needed from the weekend in order to be in contention for a berth in the playoffs. After Friday, the Vikings were still in contention for a spot in the playoffs, but in order to keep the berth they would need to win their last three games while Finlandia University would need to lose their last three games. After the loss of Saturday night’s game, the Vikings were eliminated from the postseason, but they still have the opportunity to impact other teams’ positions in the offseason with the last two games of the season. The Vikings have two home games this weekend. It will not be an easy weekend, but the Vikings will still give it their all. The first game will be on Friday against Northland College. “Northland is a hardworking, opportunistic team that looks to take advantage of mistakes, so we need to limit them on Friday,” said Koepplinger. Saturday night will be their last game of the season as well as the team’s senior night. The game will be against the College of St. Scholastica. “Scholastica is a team that has some good skill, but has been struggling since the break,” said Koepplinger. “We are looking to take it to them again on Saturday night.” With their heads held high, the Vikings will give a valiant effort to take these last two games, and hopefully end the season on the win for the seniors that are on the team.